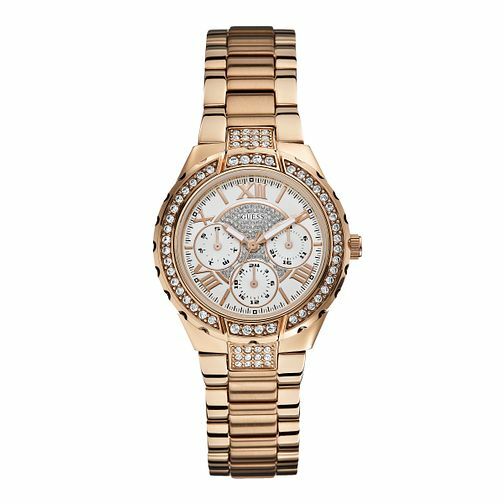 This Guess ladies' watch features a rose gold plated case with crystal detailing and glittered effect bezel, multifunction white dial with more shimmering set stones, and rose gold tonebracelet. This timepiece is the perfect glamorous accompaniment to any outfit. Guess Ladies' Crystal Rose Gold Plated Bracelet Watch is rated 5.0 out of 5 by 8. Rated 5 out of 5 by Anonymous from Beautiful watch at an amazing price!! I got this watch on sale as a present for my niece on her engagement and she absolutely loved it . Good value for money .